America’s affluence, success with mass production, rich oil reserves, and growing network of paved roads all helped to make it a nation of drivers. Owning a car conferred social status on its owner and gave many drivers a sense of autonomy and freedom. Many Americans desired cars, but the economic and cultural realities of the early 1900s often restricted automobility to wealthy and middle-class families. Almost as soon as the first automobile took to the roads, American children played with car toys, read car books, and even learned how combustion engines worked. Making cars a part of kids’ lives—even kids whose families didn’t own cars—helped make automobile ownership appealing to future generations of car buyers. Because much of this material targeted boys, it helped shape a society in which women were far less likely to own and drive a car. Advertisers assumed that boys had a great interest in, and a significant influence over, their fathers’ choice of car. In ads like these, car companies tried to manufacture enthusiasm among boys to create a bigger market for automobiles. Toy cars appeared almost immediately after the automobile was invented, along with books that explained how engines worked. Not all motor-related images and advertising excluded girls—as the Briggs-Stratton scooter ad shows—but most downplayed girls’ interest in motor vehicles, or left them out of the picture completely. Pedal cars let young drivers operate a vehicle. 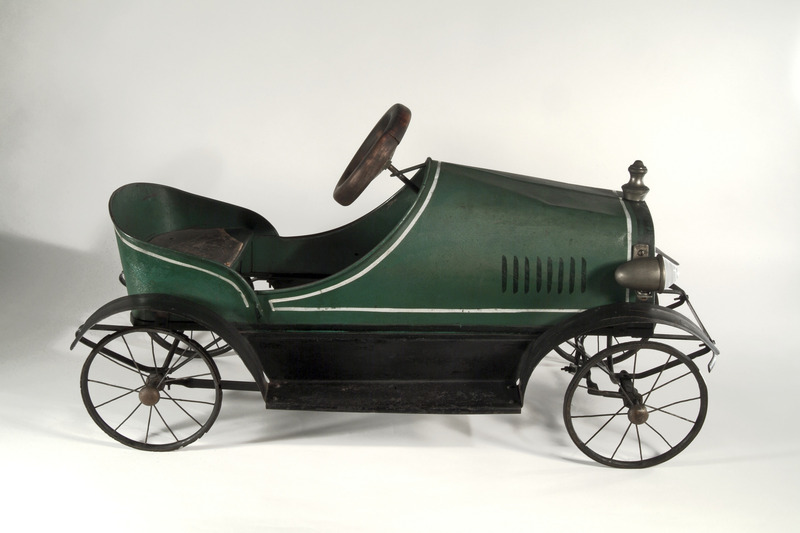 This early pedal car would have been too expensive for most families, but its attention to detail and its attempts to mimic “real” cars are typical of early auto toys. Today, most people learn to drive in school, and all states require that you pass a driver’s test. If you bought a car in 1920, you probably learned to drive from the local car dealer, your car’s handbook, or a friend or relative.